When it comes to technology and the environment, it often seems like it’s “one step forward, two steps back.” Basically, sometimes the new and innovative technologies that are intended correct for one set of problems inevitably lead to new ones. This appears to be the case with the transition to solid-state lighting technology, aka. the “lighting revolution”. Basically, as nations transition from traditional lights to the energy-saving Light-Emitting Diodes (LEDs), there is the potential for a rebound effect. According to an international study led by Christopher Kyba from the GFZ German Research Center for Geoscience, the widespread use of LED lights could mean more usage and more light pollution, thus counter-acting their economic and environmental benefits. The study, titled “Artificially Lit Surface of Earth at Night Increasing in Radiance and Extent“, recently appeared in the journal Science Advances. Led by Christopher C. M. Kyba, the team also included members from the Leibniz Institute of Freshwater Ecology and Inland Fisheries, the Instituto de Astrofísica de Andalucía (CSIS), the Complutense University of Madrid, the University of Colorado, the University of Exeter, and the National Oceanic and Atmospheric Administration (NOAA). To put it simply, the cost-saving effects of LED lights make them attractive from a consumer standpoint. From an environmental standpoint, they are also attractive because they reduce our carbon footprint. Unfortunately, as more people are using them for residential, commercial and industrial purposes, overall energy consumption appears to be going up instead of down, leading to an increased environmental impact. This data is not consistent with energy reductions on a global scale, but rather an increase in light pollution. The increase corresponded to increases in the Gross Domestic Product (GDP) of the fastest-growing developing nations. Moreover, it was also found to be happening in developed nations. In all cases, increased power consumption and light pollution has natural consequences for plants, animals, and human well-being. The team also compared the VIIRS data to photographs taken from the International Space Station (ISS) which showed that the Suomi-NPP satellite sometimes record a dimming of some cities. This is due to the fact that the sensor can’t pick up light at wavelengths below 500 nanometers (nm) – i.e. blue light. When cities replace orange lamps with white LEDs, they emit more radiation below 500 nm. The effect of this is that cities that are at the same brightness or have experienced an increase in brightness may actually appear dimmer. In other words, even in cases where satellites are detecting less radiation coming from the surface, Earth’s night-time brightness is actually increasing. But before anyone gets to thinking that it’s all bad news, there is a ray of light (no pun!) to be found in this research. “Other studies and the experience of cities like Tucson, Arizona, show that well designed LED lamps allow a two-third or more decrease of light emission without any noticeable effect for human perception. There is a potential for the solid state lighting revolution to save energy and reduce light pollution, but only if we don’t spend the savings on new light”. The selected images were judged to be those most effective in impressing the public on both how important and delicate the starry sky is as an affecting part of our nature, and also how bad the problem of light pollution has become. The overall contest winner and first prize in the Beauty Of The Night Sky category is our lead image, taken by Stephane Vetter of France, for his March 2013 panoramic photo “Sky Above Godafoss” of aurora and the Milky Way over the “Waterfall of the Gods” in Iceland. Stars over Salzburg, Austria by Andreas Max Böckle, the first winner in Against the Lights category in TWAN 2013 Earth & Sky Photo Contest. ‘Crossed Destinies,’ the Milky Way of Reunion Island, Indian Ocean by Luc Perro from France is the 2nd place winner in the Beauty of the Night Sky category in the TWAN 2013 Earth & Sky Photo contest. Images of the Earth at night, taken from space are always a stunning sight, with cities, countries and whole continents glittering like jewels. But this beauty comes at a price. It used to be that anyone looking up on a clear night could see the Milky Way. As more and more of us are drawn to live in urban areas, our view of the sky is blotted out by the glare of our lights. Astronomers have known about the growing problem of light pollution for a long time. Now ecologists are becoming concerned that our artificial lights are affecting more than our view of the stars. Researchers at the University of Exeter studying the ecological impact of artificial lighting have noted changes in distribution of invertebrate communities around artificial lighting which could affect the broader wildlife that depend on them. Simply put, it is easier for predators to find their prey, and harder for the prey to hide, in brightly lit areas. Streetlights may also be disrupting the natural rhythms of both fauna and flora, changing hibernation patterns and flowering times. It may also be affecting our own circadian rhythms as well as being a colossal waste of energy, an estimated $2.2 billion per year in the U.S. alone! On average, 30% of the light from a streetlight shines up and out. Light pollution is a growing problem. Artificial lighting is increasing at the rate of 6% each year globally and is only going to get worse, as developing nations use more and more electric light. 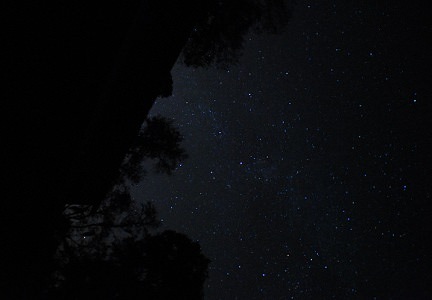 Since 1988 The International Dark-Sky Association has campaigned to protect and preserve the night environment and promote energy efficient options. Light what you need, when you need it, they say. One of their projects is the International Dark Sky Places program which certify locations with exceptional nightscapes, either as communities, parks or reserves. The Kielder Forest and adjacent Northumberland national park covering 400 square miles in the UK is the latest area hoping to join the 12 dark sky reserves already recognised by the IDA worldwide. Such status can bring economic advantages too, astronomy is rapidly growing in popularity and with it astronomy based tourism, offering dark skies, observing opportunities and star parties and star camps. Losing the stars can have a lasting impact on our culture too. Think of all the art, literature and music that have been inspired by the night sky. As we become increasingly disconnected from nature the stars are one of our most important links. There are many people today who have never been able to look up and see the Milky Way arching over their heads. Looking up at the stars allows us a vital opportunity to engage with the larger questions posed by the universe. [/caption]Are you a fan of Citizen Science? Do you enjoy participating in projects that help researchers and possibly the environment? GLOBE at Night is one such program! By taking naked-eye observations of the night sky in your area, you can help a world-wide effort to track the effects of light pollution. Here’s all the info you need in order to participate in GLOBE at Night during 2012. For starters, what is GLOBE at Night? The GLOBE at Night program is an international citizen-science campaign designed to raise public awareness of the impact of light pollution on our night skies. GLOBE at Night aims to raise awareness by inviting citizen-scientists to measure their night sky brightness and submit their observations to a website from a computer or smart phone. Light pollution not only threatens our “right to starlight”, but also affects energy consumption, wildlife and health. For the past six years, the GLOBE at Night campaign has been involving people in 115 countries. 3) Match your nighttime sky to one of the provided magnitude charts. You can also use the new web application data submission process. The GLOBE at Night website is easy to use, comprehensive and holds an abundance of background information. The database is usable for comparisons with a variety of other databases, like how light pollution affects the foraging habits of bats. If you’d like to learn more about GLOBE at Night, visit: http://www.globeatnight.org/ , or the 365 Days of Astronomy Podcast: GLOBE at Night Kickoff: Seeing the Light.